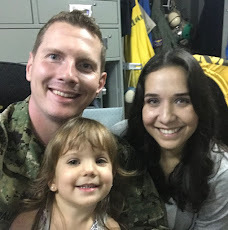 During the months of May and June, the little one and I made a long trip back to the States to visit family and friends while my husband was at the beginning of his deployment. To say it was an adventure would be an understatement! She's 2 now and she's good at it. She's been on planes since she was three months old, so she's pretty comfortable with flying but we've never done a long-haul just her and I. The trip itself included stops in Texas, Arizona, Illinois, Virginia, Pennsylvania, Massachusetts, and then back to Japan. That was a grand total of 8 plane rides, two were 12+ hours long, and one road trip up the east coast. The lead up to the trip was so full of anxiety, not only because I would have to do all of this on my own, but because I am not a good flier to begin with. I know, the sweet irony of being married to a pilot. Apparently its super common. lol. That anxiety lead me to do a ton of research online in mommy blogs, travel blogs, and advice from local parents who have made the trip back to America with kids multiple times. This list is full of the tips that I tried and loved on our trip, as well as items and links to purchase them, that I cannot image traveling without! Everything on this list helped me keep my sanity at 30,000 feet! Enjoy! The few weeks leading up to the trip were the most anxious for me and I was determined not to let that rub off on the little one. So, I would remind her that we were going on a plane, that we were going to fly and have tons of fun on the planes and with the family that we were going to see at the end of the plane rides. I always topped it off with a reminder for her to be good and to listen to mama. I also read the book, Good Night Planes, to her a lot. I picked it up in the Phoenix airport the last time we were visiting. I think the mantras and the prep helped both of us so that when we left the house and made our way to the airport, she was excited about the plane ride and family, and not questioning where we were going. Positivity for both of us! Take another look at the picture up top. Lizzie is wearing a sparkly tutu, her favorite converse, one sock is rolled up over her pants, and her hair is in a pony that did not last long when she was trying to get comfy in her seat. But that is what she wanted to wear that morning, so its what she left the house in! She was so happy. It definitely started the travel day on a good foot and with an even tempered toddler, which as you parents know is worth its weight in gold. Both international and domestic flights have drinks and food for purchase or gratis, but they are geared towards the adult customers. And if you have a picky eater, there is nothing worse then a hungry kid not eating their food because it is something they don't like. Don't take the chance, and simply pack your own snacks and maybe a small, portable meal from home or the airport. I packed jerky, raisins, chewy bars, trail mix, Nutella snack kits, gold fish, skinny pop in the lunch bags, some Japanese snacks, and a little bit of candy for treats. Basically everything you would find in the average elementary-aged kid's lunch box. Our JAL flight offered kids meals when I called to arrange our seats and I jumped on that. The kid's meal was a more American style meal with pasta, while my adult meal was more Japanese with soba noodles and small, Japanese salads. Both meals came with this delicious Ben & Jerry's treat for desert though. yum. I always buy a few bottles of apple juice in the terminal so I don't have to ask the flight attendant over and over again for refills. And don't forget a reliable sippy cup or water bottle to stop any spills before they get the chance to happen. We got lucky that JAL had their own version of kid's cups when ours ran off under the seats for a bit. The iPad is your best friend on international flights. The inflight entertainment can be hit or miss on non-American-based airlines. They will have international blockbusters, both adult and kid friendly. I was finally able to watch La La Land and Lizzie helped herself to her 1,000th viewing of Moana. But they will also be catering to their home country's tastes and viewing preferences with a larger selection of their popular television shows and movies. I highly, highly recommend loading your devices with all of your child's favorites, both movies and television. I had her iPad, my iPad, and both my American and Japanese iPhones filled with whatever she could want. I did everything in my power to avoid a breakdown because I didn't have a Doc McStuffins episode or a certain princess movie. Don't forget kid-sized headphones! I did bring a few small books and toys to entertain the monster in-between screen times. Good Night Planes of course, triangular Crayola crayons (they stay on the tray table!) and coloring books are always a hit and compact in size, Disney stickers were a huge hit, as were star-shaped Post Its and window stickies. Nothing that made noise, rolled, or bounced was allowed, just for the simple fact that I didn't want to chase them down the aisle or disrupt other passengers. Small, wrapped gifts were one of the best pieces of advice I got from a mom here in Japan. Now I am not saying to run out to Target and spend $300 on toys. Oh no. I am saying to go down to the dollar store and raid their toy section. Daiso here in Japan is similar, and I got her all kinds of goodies for the grand total of around 20 bucks. I originally bought enough to have one present, every hour for the 12 hour flight. It was a sort of countdown to when we would land. They ended up being my bargaining chips! I would give her one when she was getting fussy or bored. The excitement and happiness from unwrapping a gift was enough to entertain her for a good chunk of time. I ended up with about half still wrapped when we landed back in America. That crown was a real winner in her book. This little device has the possibility of saving not only your sanity but your kiddo's too. It is a godsend on domestic flights that do not have any power supplies for the cabin. Almost all international flights have in-seat power sources (check your carrier), but what they don't tell you is that some of them are poorly placed in the seat design. One of our flights had the outlet under the tv so it was dangling in front of the munchkin and she was constantly catching her foot on it. It started to really aggravate her, so I used this little baby instead and tucked away the charging iPad in my bag. If you have several connecting flights, or a short layover with no time to charge in the terminal, this will save you too! They are not a tremendous investment, this one is about $25 on Amazon right now and they also have tons for less then $10. Versions like these are my favorite because they light up to let you know how much juice is left in the battery pack for your charging needs. DO NOT forget the one thing that makes your child fall asleep! I repeat, DO NOT FORGET the blankie or animal or book that is a comfort to your kid! I did! Oh my god, I was half way to Narita International on the 2 hour train ride when I realized her beloved Pup Pup blankie was on her bed. I seriously, almost cried. Thankfully the airplane blanket supplied the cover she needed to relax and sleep, but I just about had a heart attack when I realized my mistake. It could have been a very long, cranky flight. But only overpack a few key essentials. Diapers, wipes, pacifiers, formula & bottles for babies, a few changes of clothing for both you and the littles, and it seems random but: Gallon Sized Ziplock Bags. They can be used for anything! Sopping wet clothes due to a spill? Throw them in a ziplock. Got a ton of dirty bottles? Put em in there. Do not wash out or clean anything in the airplane bathroom sinks that would then be given back to your kiddo. The water is not drinkable and should not be used to clean anything other then your hands. Don't forget to pack plenty of medicines, even if your little one isn't sick. You can take liquid medication over 3oz. beyond security. We learned the hard way that allergic reactions can happen anywhere and children's medication, especially for babies and toddlers, is hard to find in an airport. Don't forget to include anything you would normally have in your diaper bag, along with some random things for ease like kids cutlery, and for emergencies like bandaids, a thermometer, and Neosporine. Don't forget the things that make traveling with kids easier for you. These are my top four. 1) I swear by the CARES harness. The harness provides just enough of a 'hold' on her that she associates with her carseat, which she always falls asleep in. I do use a little piece of shelf liner to stop her from slipping too much since it is not a 5-point system. I have used it on JAL, Korean Air, United and American Airlines without issues. In fact, it was the first time a JAL flight attendant had seen one and checked to make sure it was on the FAA list of approved harnesses and carseats. 2) The carseat luggage strap will save you when you are bogged down with luggage and a babe. 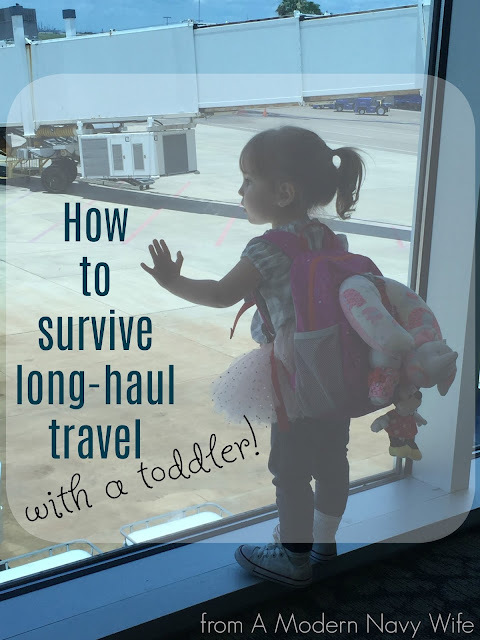 You just strap your carseat to any piece of rolling luggage, carryon or check sized, and you suddenly have a free hand. 3) My Mountain Buggy Nano is a super close 3rd on my favorite travel necessities. It folds up so small, it fit in the overhead bins of my flights, but it still has a full sunshade and can be used with an infant carseat. A wonderful investment piece that will last from birth until they weigh 50 lbs. I loved the look on the gate check agent's face when it told her I didn't need a gate check ticket and folded it right down to smaller then a wheeled carryon. 4) I also last minute purchased a Munchkin Booster Seat car protector to act as a crumb & toy catcher and a non-slipping mat. And bonus for those potty training: It will stop any potty training mishaps from getting really, really messy on cloth airplane seats! Mommy and Daddy need a break too. I usually buy a few magazines before takeoff, some snacks, and a large bottle of water so I don't have to keep on asking for refills on the plane. A dual-air chambered inflatable pillow is my favorite for a quick cat nap or just neck support. They are compact and can be adjusted unlike those stiff donut ones you can't manipulate. For $10, totally worth it. My iPad was half kiddie-half mine. I put all of my favorite relaxing movies on it, romantic comedies :) and reloaded my Relaxation playlist that I like to listen to during turbulence. I also started a new trick during turbulence, I start my stopwatch on my phone and then turn on my music, when the bumps are done, I pause the stopwatch. It's usually a surprisingly short amount of time that the turbulence actually was. It always feels so much longer. I still hate it, but that helps me get through it a little bit better. I always have a good pair of noise canceling headphone to use when the babe's asleep or content and entertained, so I don't have to worry about not hearing her. The Bose earbuds are my absolute favorite! Now, these are another investment. To be honest, I don't know if I ever would have bought them for myself, they were a gift from my father. But, you only need to use them once to realize their worth. They are amazing! The battery lasted the entire 12 hour flight time and then some. I bought a pair for my husband to take on deployment to drown out the boat noise. Remember, when mama and daddy are happy and calm, everyone else will be about 85% normal, because lets be honest, no toddler is 100% calm! One of the tricks I kept on hearing was to try to keep your normal routine leading up to sleep so that sleep was encouraged and natural, and not just a happy accident. Easier said then done people! But we were able to attempt our nighttime ritual on one of our overnight flights. If you have an overnight flight where the lights will be off and everyone is encouraged to sleep, this is the best and easiest time to attempt your normal bedtime routine, since it will be dark and mostly quiet. Have everyone put on pajamas, brush their teeth and read a book or just snuggle until sleep comes. When we were able to change into some comfy clothes, brush teeth and relax, Lizzie slept for a good 5 hours and even I caught a wink or two. Beyond your passports, drivers license and tickets, there are a few more pieces of paperwork that are great to have and may be a necessity. Especially if you are traveling solo with your child like I was. A copy of your child's birth certificate is always good to have on hand when they are young, especially domestically if they are traveling as a lap child and close to the 2 year-old cut off. It acts as proof that they are below 2 and do not require their own seat if you don't have a passport for them. When you are traveling alone with children internationally, it is important to check and see if you need a birth certificate and a notarized letter from the absent parent so that you can enter another country solo with your child. This is one that I never heard of before, but it was a nice piece of paper to have just incase. Go to the US State Department International Travel Site, click on the country you're traveling to, then click the 'Entry, Exit &Visa Requirements' tab. Scroll to the 'Travel with Minors' section if there is one noted and check their requirements for traveling alone with minors. The letter should state that the absent parent is aware that the child is traveling internationally with only one parent present. Some countries have printouts available on their respective websites. If a letter is needed, you can get documents notarized at select banks, court houses, shipping stores like UPS, law offices, real estate offices, and mobile notary services. And there you have it! Now that I've written it all down, it sounds like a lot. It also sounds like I was loaded down like a pack mule during our travels. In actuality, I traveled pretty light considering what I could have packed for a month away from home. We had one checked bag, the checked car seat, and our carry ons. Do not forget a travel bag/cover for your carseat and stroller if you're checking it through or gate checking. You don't want a dirty or broken carseat greeting you at your destination. This is a pic of lizzie and our carry on load in Boston before our flight from Logan back to Narita. She had her own backpack that was loaded with her little toys, colors, water bottle, blankie, iPad, headphones, and her own neck pillow. I love that little pink bag. It allowed her a little bit of independence and a super convenient way to get to her things. They no longer sell her exact bag, but Amazon has a similar model available. I had the North Face duffle backpack and my favorite stroller all tucked away in its own little bag there. The duffle is a size small, but that bag can carry a lot of stuff and get heavy, so be careful with that, but it is damn durable. I could rely on that thing to hold whatever I wanted to put in it, from diapers to a laptop. It is another investment piece, but it is on sale on Amazon right now, and it will last for years. As far as parental hacks, I cannot recommend TSA pre-check enough! It saved us time by allowing us to skip some long lines, no shoe or jacket removal, and you keep your liquids and electronics tucked away. Basically, you don't have to get naked and shoeless, while spilling all of your carryon items on the line just to get to your laptop that is at the bottom of your bag. Not that that happened to me or anything. lol! The Global Entry Program is next on my list of adult-life-travel hacks to complete. I love the idea of not having to deal with the wait and frustration that is customs. I will have to wait until we get back to the States again to begin that process, but I can't wait to simplify international travel even more. I hope that these tips and goodies are some that will help you in your future travels. Let me know which ones worked best for you, and which ones you discovered on your own that you couldn't imagine traveling without knowing! Fair Winds, Following Seas, and Safe Travels!